Last night I had a meeting with my regional Heritage Foundation representative. I am a Sentinel for the Heritage Foundation, and every once in a while we all get together to have dinner. I am now the longest member of the Sentinel program in my region, it seems, and the room was mostly new faces. One of them, a gentleman from San Diego County named Bob, who is an economics guy (in addition to a tech background) told me that President Donald Trump's economic success, of which Obama has no business taking any claim to, is obvious when you look at a chart that shows the "breadth of the Dow Jones Industrial Average." While I am an economics guy, I was not sure what Bob was talking about. So, he pulled up a chart and showed me. 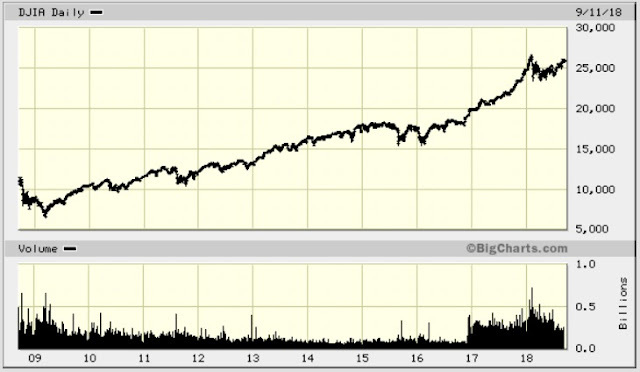 "The lower chart," he said, "is the one to look at. Look how it slowly was in decline during the Obama presidency, and then suddenly there is the wall of straight up success and improvement once Trump won the election in 2016." Is this a result of confidence in the market because of the election of Trump? Whatever it is the result of, the wall of success is obvious. Bam, right there at election day, the black decline slams into a wall of success. I haven't heard this from anyone else. Is the media ignoring Trump's economic successes? Why hasn't Fox Business talked about this?